[Anniversary Event] Stop Giving Us Secret Code Event, Victoria! 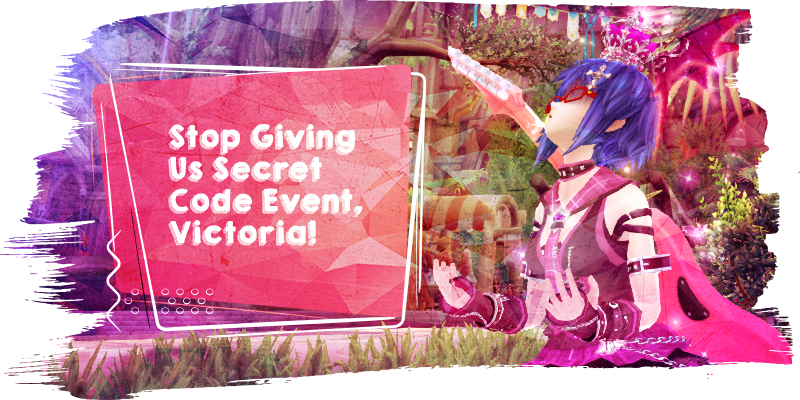 Thread: [Anniversary Event] Stop Giving Us Secret Code Event, Victoria! Aside from server anniversary, it marked our 1st year as GMs too! Of course, to commemorate this special day, the self-proclaimed 100F STH boss will hold her favorite event of all time to celebrate this occasion!! ☼ Hidden Letters have been discovered on several locations, at FORUM. ☼ These letters are scattered under [GM]Victoria's Post, you must assemble these scattered letters to form 4 words which is a Secret Code from Victoria! ☼ There are 13 LETTERS in total! ☼ You are NOT ALLOWED to RESERVE or EDIT your entries. Reserved/Edited entries will be automatically disqualified. ☼ Only one IGN is allowed to participate from each account. ☼ Your screenshots must consist of each hidden letters. These letters are sorted according to your Secret Code's word. ☼ Your screenshots MUST be CROPPED. Only the hidden letters and surrounding text are visible(if there's any). You're all might be thinking, why you should go this far to find the Secret Code hidden behind numerous post at forum, is the GM trolling you? for the first 3 Winners!!! Er, does this Lv85 Instant Ticket mean we skip through till lv85 quests as well? How many entries may we submit? The Insta Level 85 card allows you to create a new character (you cannot use it with already created characters). When you use the Insta Level 85 Card, the characters's Tutorial stage it's a different one, in which you have to complete three small challenges in a different map hosted by the Templars. Once you finish it, the character enters the world of Azuria as a level 85 char. By completing this tutorial quest, you skip all previous quests until that point and CAN ENTER previous maps without problems (You still need to complete the following quests). You also receive a level 80 Godhroon weapon in your mailbox as reward for completing the quest and if not mistaken a box with a few other items. Last edited by [GM]Victoria; 02-15-2018 at 03:04 PM. is this xmas already?? literally, one of my wishes. will the prize : "Instant Lv 85 Character Ticket" be tradeable?? estimation time to release on AP/BP?? geez, this annoying Kyaa ask so many questions. Ahh yes, did you hear of the crypto currency bubble popping and prices crashing yet? i think it happened like a month ago? Dose this count replies too?? Or just the initial post? ?